This convention kind of snuck up on me and I thankfully found out about it a few days before it actually started. 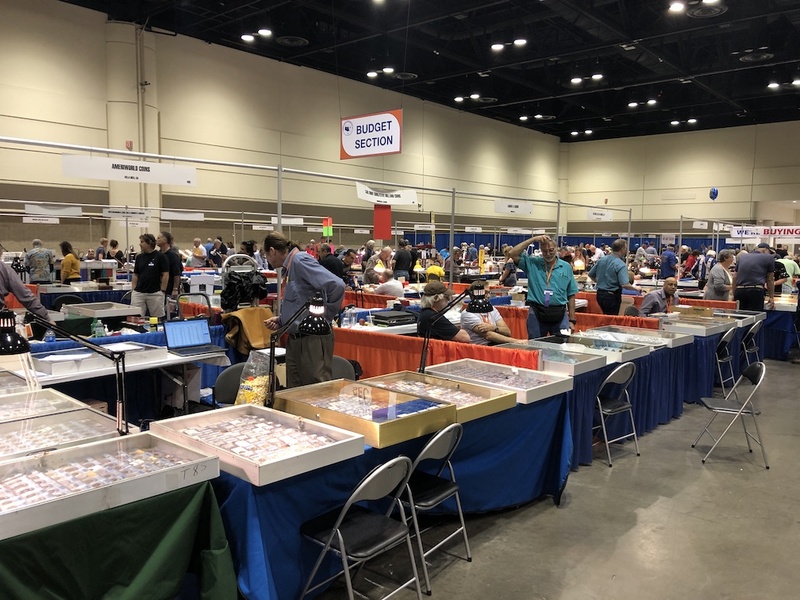 FUN stands for Florida United Numismatists and they have two conventions a year, one in the winter and another in the summer. 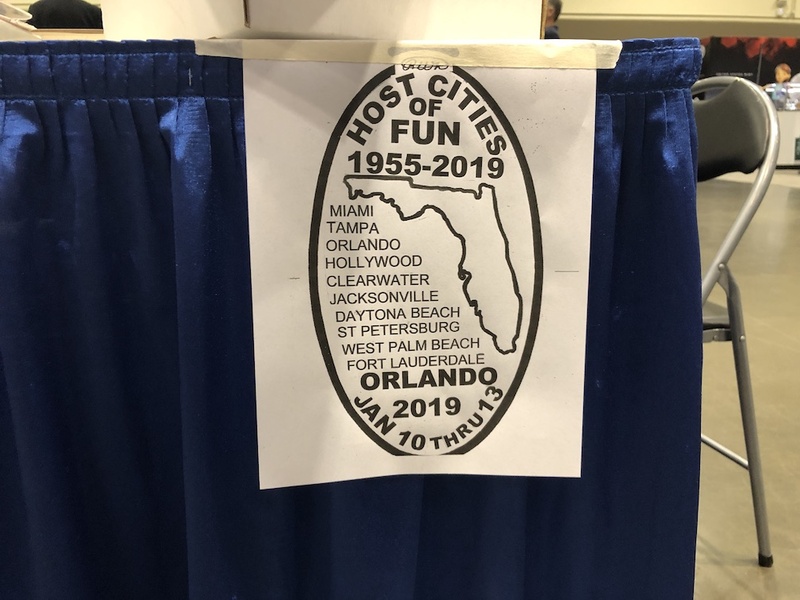 It moves around to various cities throughout the state and this year luckily it was in Orlando at the Orange County Convention Center. 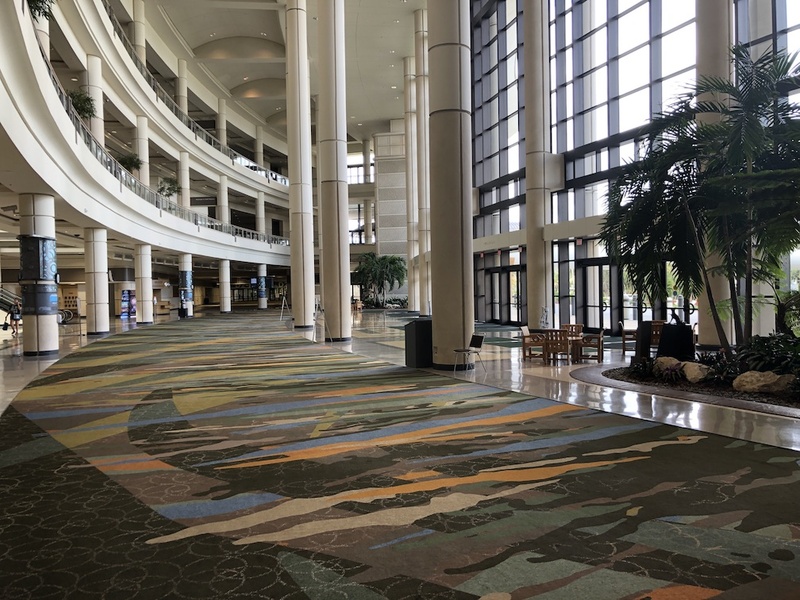 I’ve been to a few events in this convention center but wow it always amazes me how huge this place is. If you make the mistake and park in the wrong area you could be walking for quite a while. Once I found the right area of the convention center I checked in to get my name badge and was given a few special items for visiting. 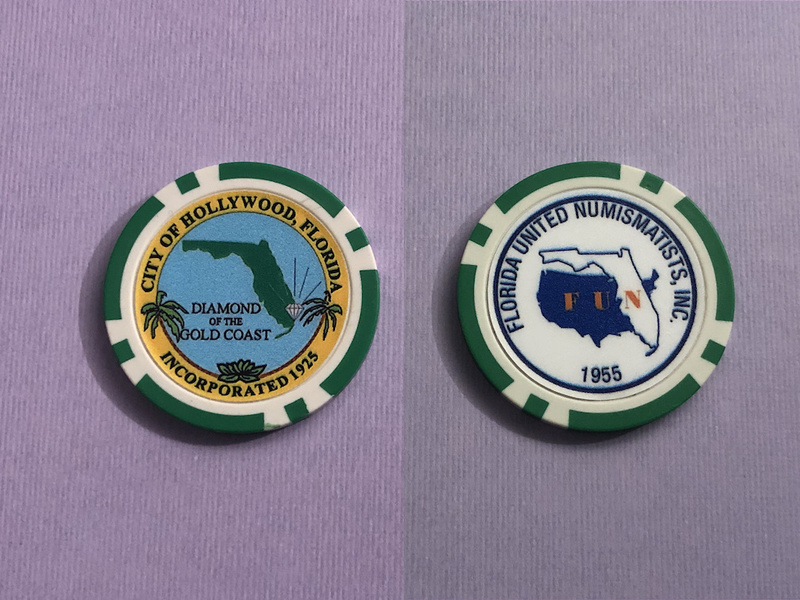 The first one reminded me of a casino chip, and had the city of Hollywood Florida on the front, and the Florida United Numismatists on the back. 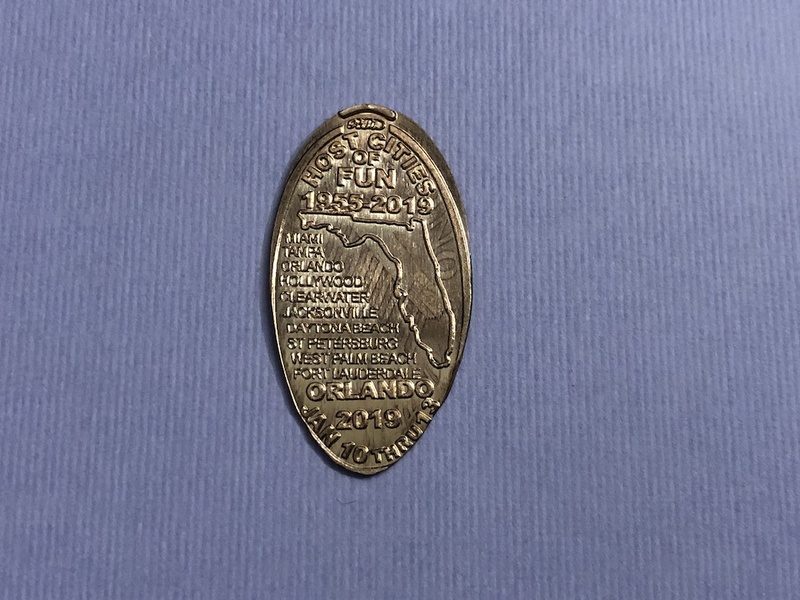 The second item was a beautiful medallion about the FUN convention host cities. 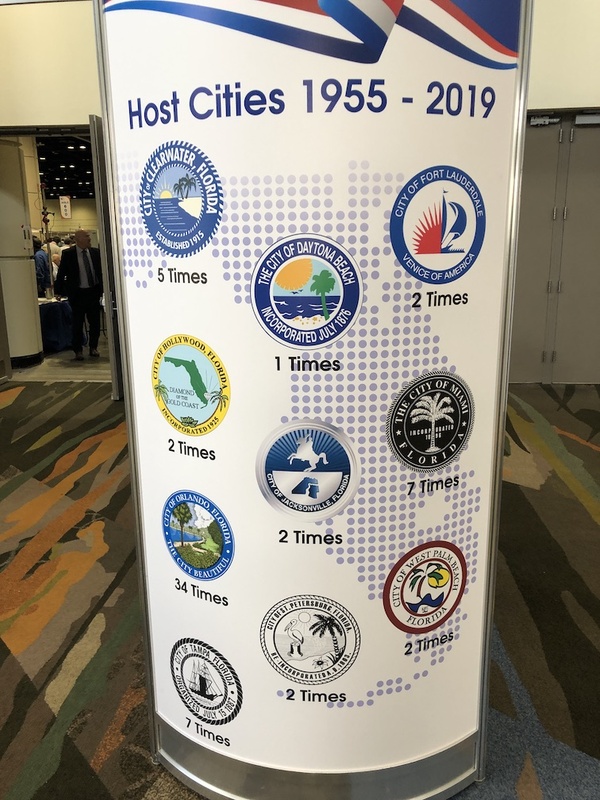 The back listed each city and the number of times it has hosted the event. 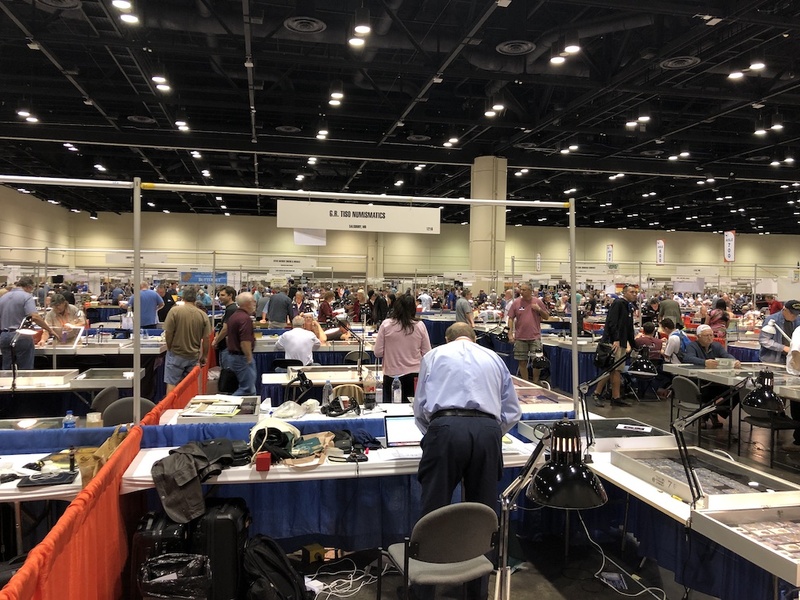 Before I go too much further I should mention that admission to this event was free, other than the cost for parking at the convention center. As we headed towards the main entrance to the show there was a banner welcoming everyone to the show and even had some details on the other hosts sites which seemed to be a trend here. Once inside I’m always blown away by how big these shows are and the number of vendors. 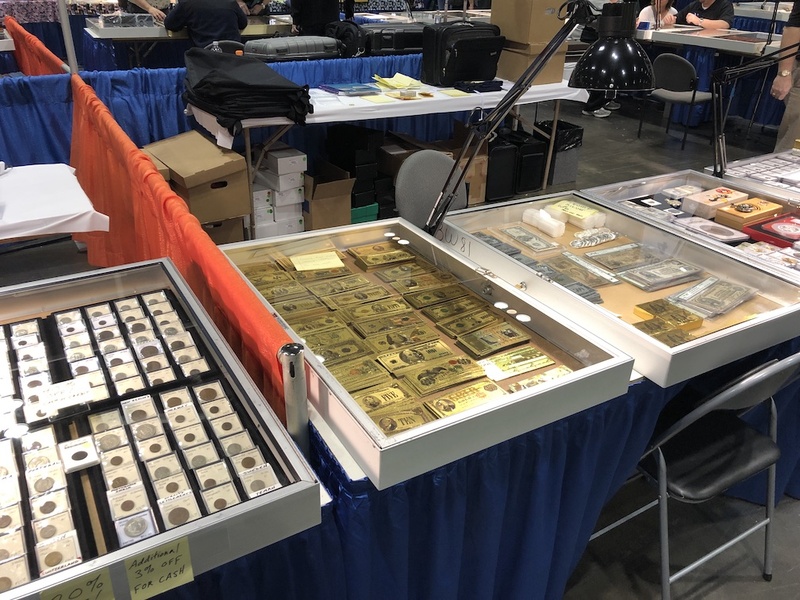 The tables are literally wall to wall with everything you could possibly imaging when it comes to collecting coins or any time of currency. Many of the vendors were looking to buy as well as sell their own items, and there seemed to be a lot of transaction happening all over the place. 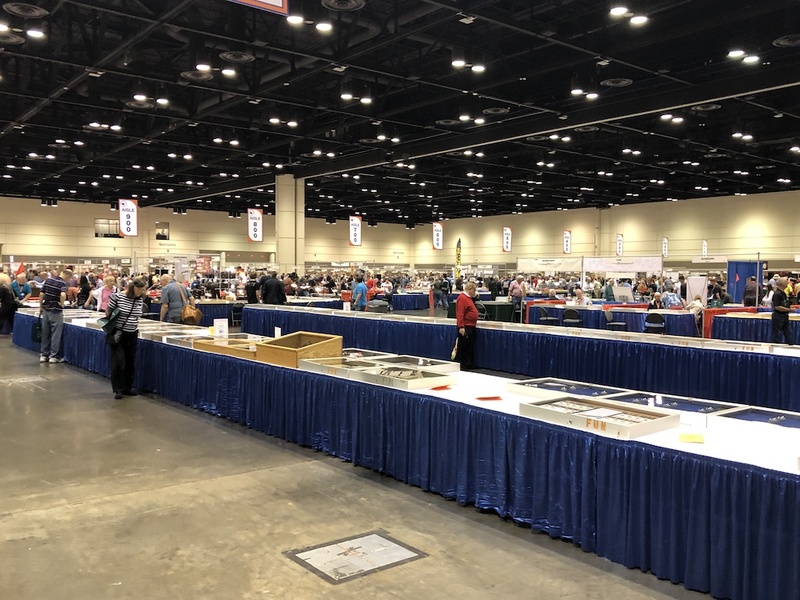 All the way in back was where the exhibits were where people have displayed some of their collection with a certain theme. There are different categories and all are judged with the change to win your division. I did come across some of the exhibits that had some elongated coins which I always love to take my time looking at. The hard work and details they put into these are really amazing. Below is one I came across that was about the FUN conventions of previous years. After enjoying the exhibits we grabbed a quick snack in the food area, and then headed back to the aisle of vendors. 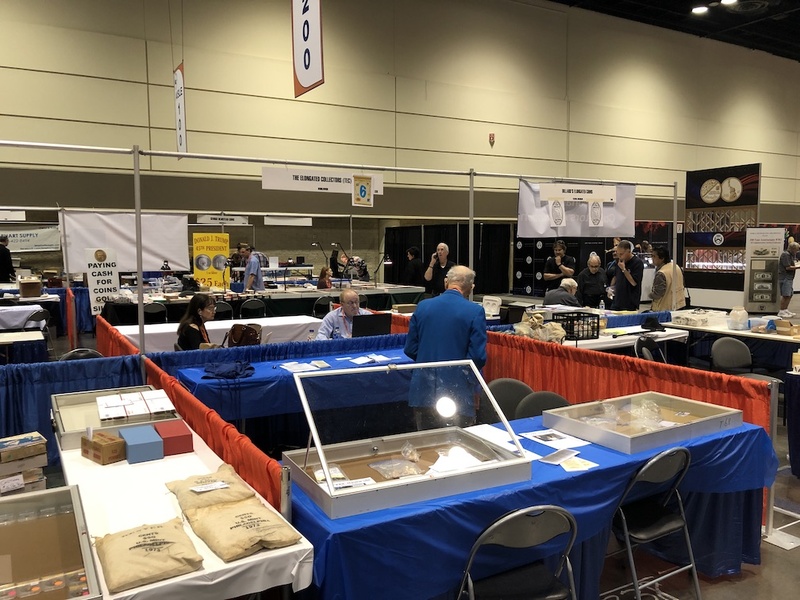 Eventually we found the TEC (The Elongated Collectors) Club table that was located right beside Mr. Raymond Dillard’s table. Mr. Dillard was working both tables at the time we stopped by. 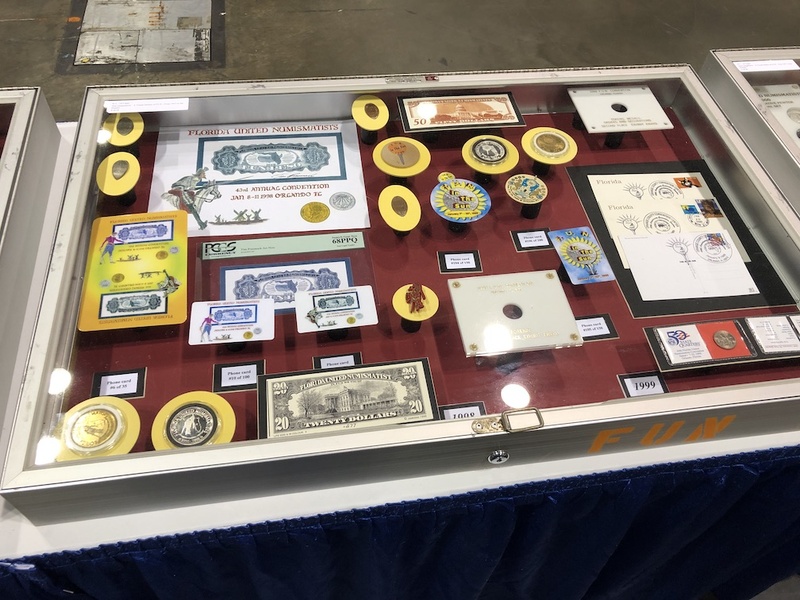 I had met him for the first time about 6 years ago at the ANA World’s Fair of Money convention in Philadelphia. He is an amazing wealth of knowledge not just about elongated coins, but a wonderful man to just sit and chat with. 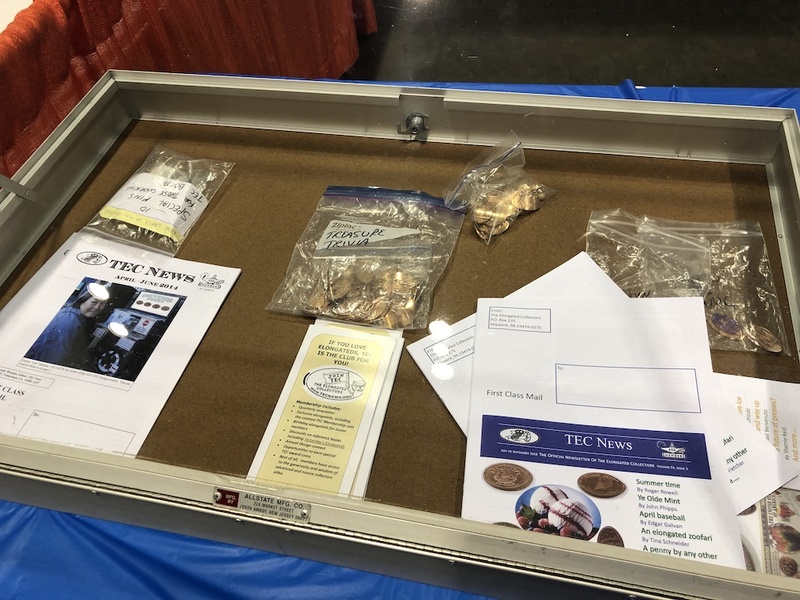 The TEC table had lots of information about the club including some recent issues of the new letter, pamphlets about the club, and of course applications for anyone interested in joining. 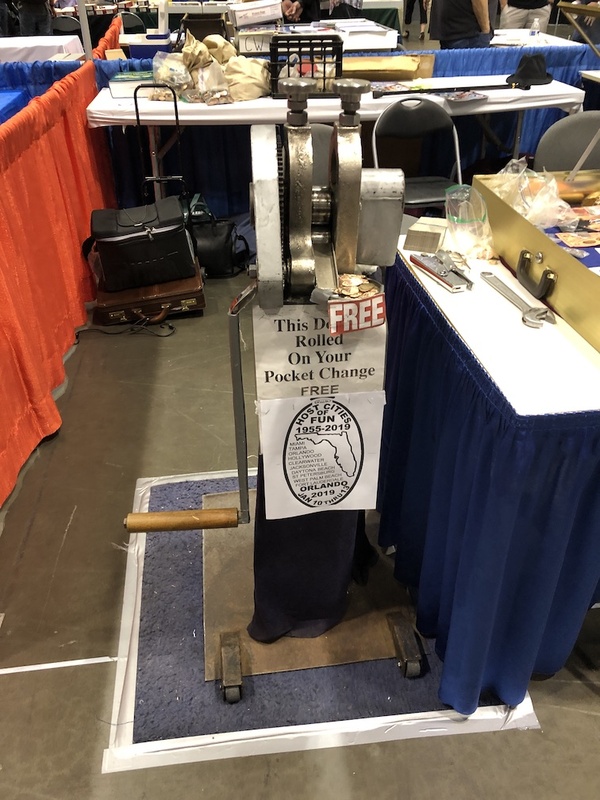 There was also a free pressed penny that they were giving out. Mr. Dillard was also busy with his own table. 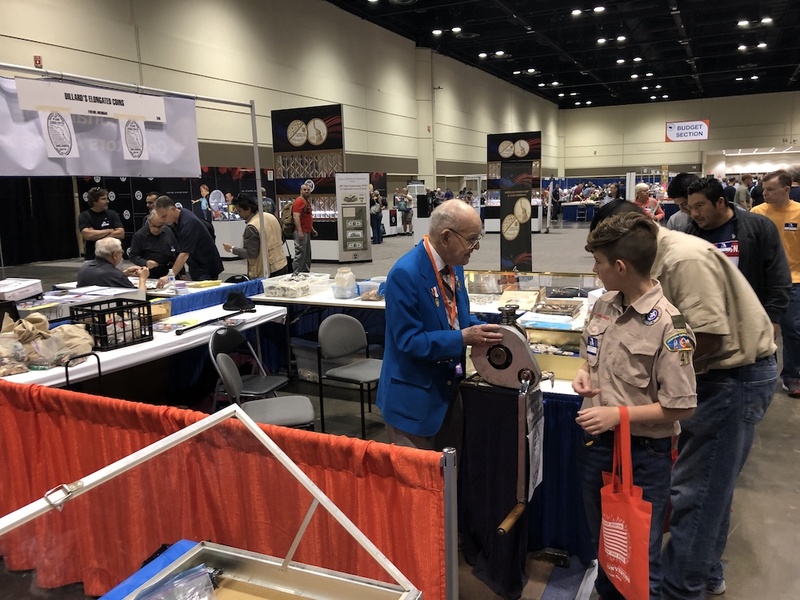 His manual coin press machine is always a visitor favorite. I wonder how many coins have been pressed on that machine. He was giving out a free pressed penny as well. Usually if you have a special coin you want to press he will be more than happy to do so for you. Otherwise the tray on the machine was filled with freshly pressed pennies. This was another really nice looking design for the FUN convention. As was the theme I mentioned earlier, the design listed all the host cities of the show. 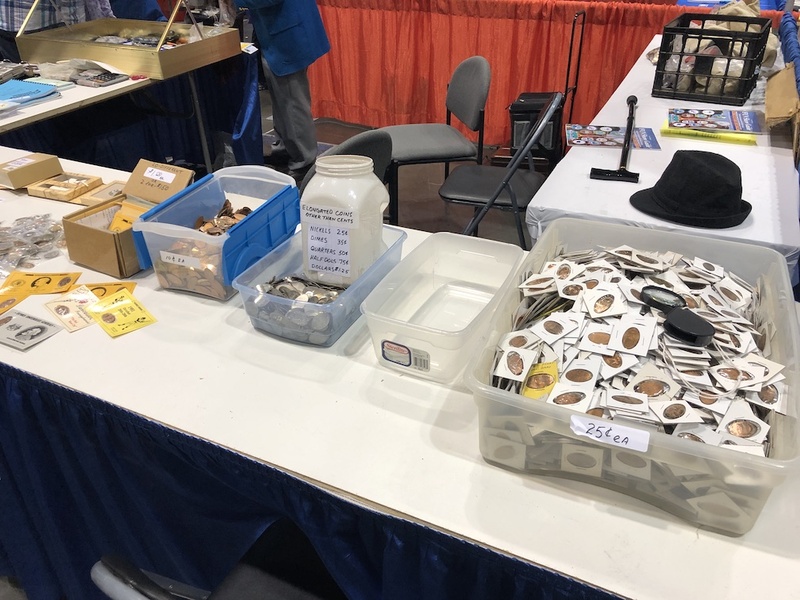 Not only was he handing out free pennies, but his table was covered with lots and lots of pressed coins at very reasonable prices. I could spend a lot of time going through some of those bins of coins. We had a great afternoon spending time with Mr. Dillard and some other elongated collectors. Eventually we were getting a bit tired and had a long walk back to our car still to make. 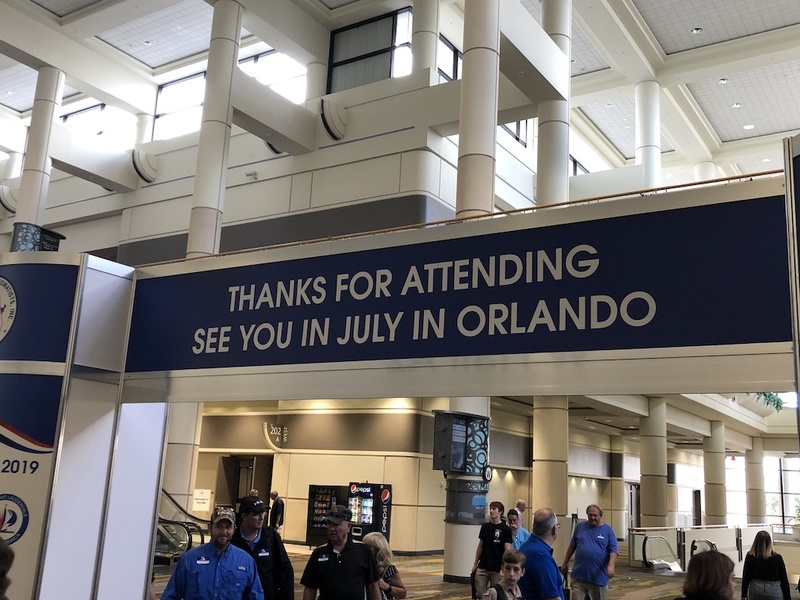 As we headed out I noted the next show would be in July and still in Orlando so we will be sure to come back them. It was really a lot of fun and had lots of unique things to check out. 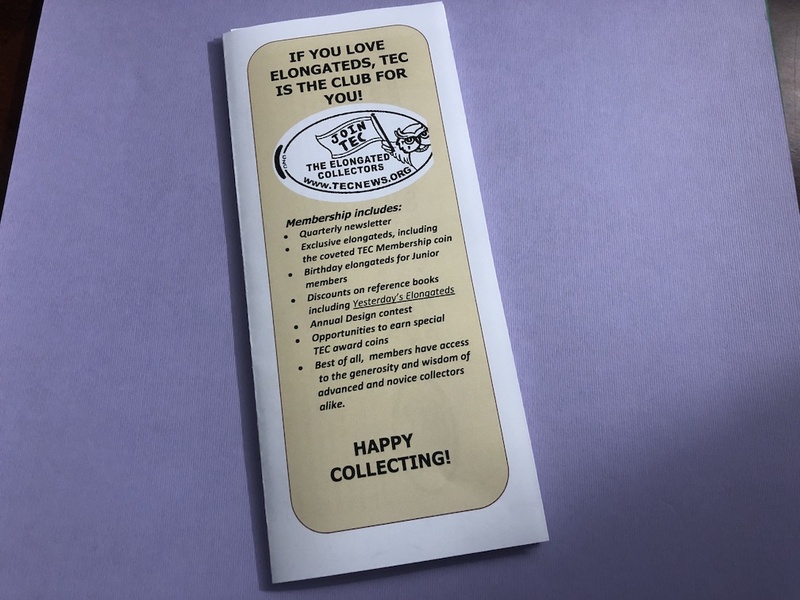 If you are not already a member of TEC you really should check it out. I’ve been a member for about 10 years now and have thoroughly enjoyed being a member. 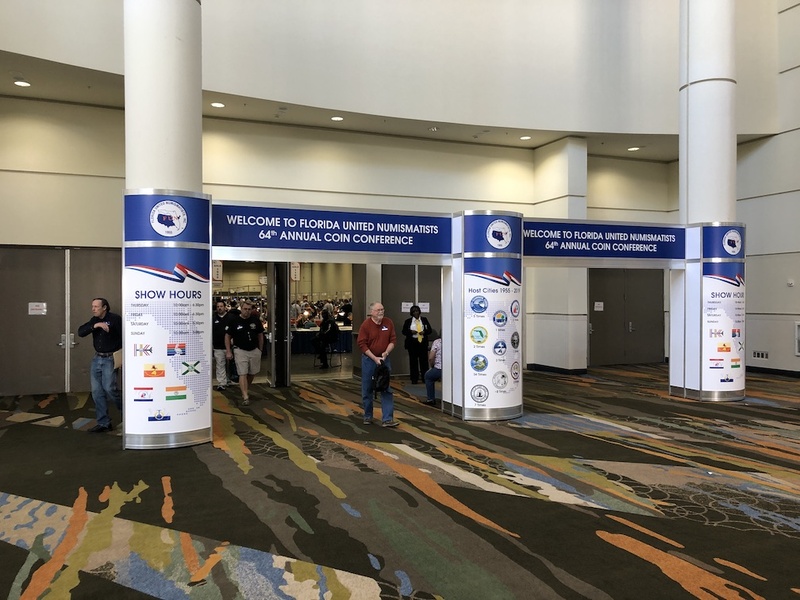 The cost is very reasonable, for 2019 the dues are $11 for a 1 year digital membership or $15 for a hard copy membership. That just means you get the quarterly newsletter either digitally (PDF in an email) or a hardcopy in the mail. 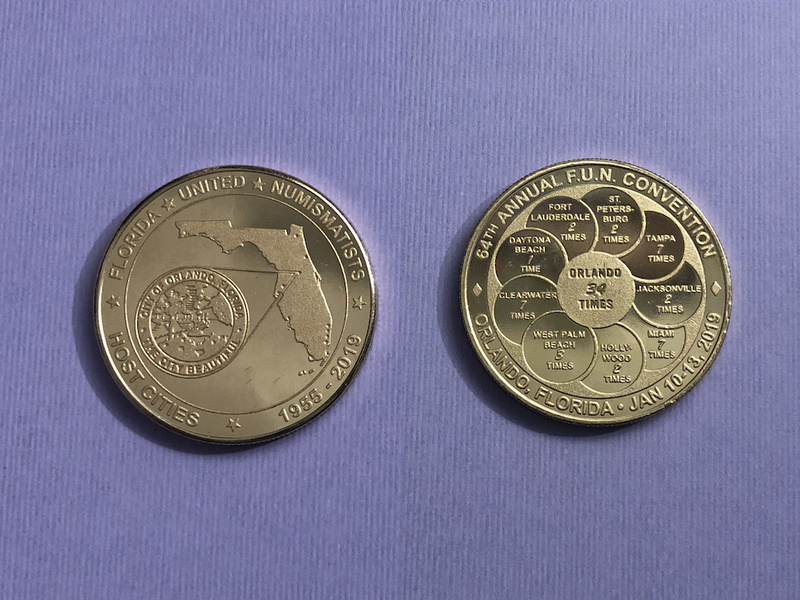 Each quarter you also get a nice little package with pressed coins inside as well as the coveted membership coins each year. 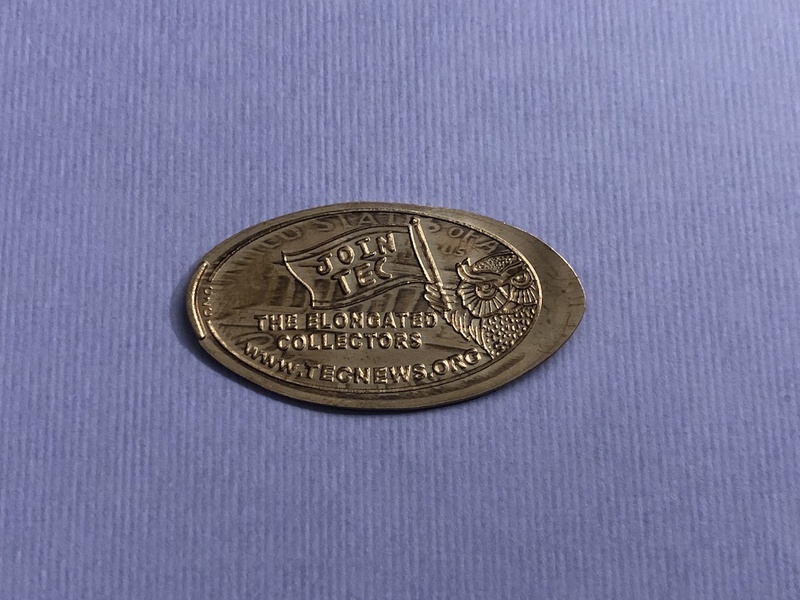 There is a special editors coin you get if you submit an article to be published in the newsletter and also a recruiter coin if you help a fellow collector join the club. On that note you can join by visiting the website www.tecnews.org and click on the Join/Renew coin. 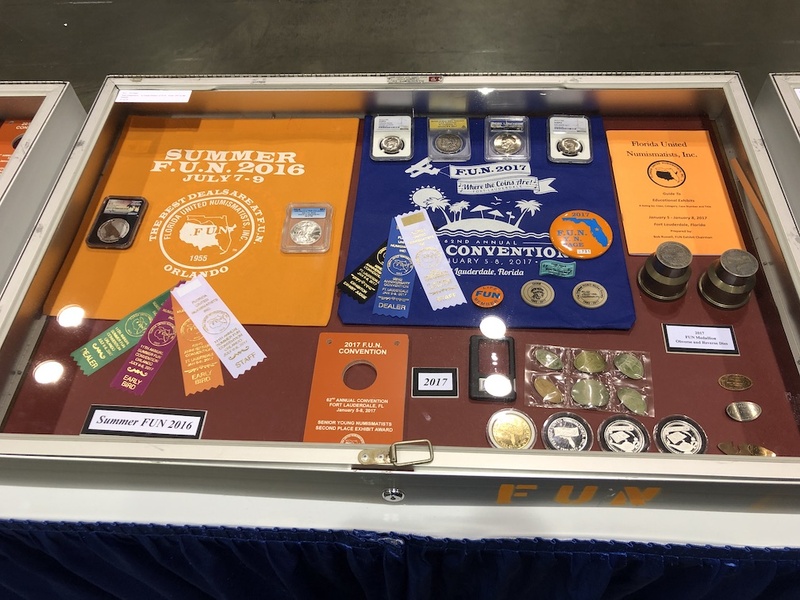 Be sure to reference member #4237 so they know I’m helping spread the word and sharing the adventure of elongated coin collecting.